CES started this week in Las Vegas. I wish I was there escaping the arctic blast that has engulfed the midwest since before Christmas but, alas I am not. None the less I can still keep up to date sort of with the flood of web posts and press releases coming from the show. Yesterday Klipsch announced their latest speaker product due to release later this year, and I have to say I am excited. The Klipsch LightSpeaker is the first commercial version of something I posted about earlier this year on Facebook, and listed as one of my top ten design ideas of 2009. SoundBulb by designers Hoang M Nguyen, Poom Puttorngul & Anh Nguyen. Klipsch has not said if they licensed the design and technology from Hoang M Nguyen, Poom Puttorngul & Anh Nguyen, and frankly it doesn’t really matter. Klipsch has a solid track record with producing top-notch speaker products and I’m sure this will sound great. The all-new LightSpeaker is an audio speaker that requires no external wiring or power. The device is designed to fit into normal 5- to 6-inch recessed light fixture, which enables homeowners to easily retrofit these into their ceilings and walls. You simply screw LightSpeaker into a conventional fixture, dial-up the desired zone on the bundled remote, and listen to music. A full-range driver sits just behind the LED light, and it receives signals via a 2.4GHz base station that can be plugged into just about any source for streaming audio. I am kind of surprised at the price point, 600 bucks for the base kit which includes 2 speakers, remote, and base station. For this kind of money these things better sound really solid with an extensive dynamic range. Beyond the base kit additional speakers can be purchased for 250 dollars each. The bundled controller allows you to control up to two zones and two sources. You can also adjust lighting brightness and volume via the main base station or using the smaller remote. Each zone can easily support up to four LightSpeakers. According to Klipsch the speakers are somewhat weather proof, meaning they can go outside as long as they are not exposed directly to moisture. (think in an overhang out of the wind and rain). So humidity shouldn’t affect the system. What this system needs to complete it is a wireless sub-woofer that also houses the base station. It would also be nice if they had Dolby Surround Sound support and support for other WiFi base stations like my Apple Airport Express. Now before I finish up here I want to say one thing about this that is bugging me. Why the hell did Klipsch make it look so fugly? I know you don’t see 99 percent of the light fixture, it is recessed. But still, why didn’t you borrow some aesthetics from Hoang M Nguyen, Poom Puttorngul & Anh Nguyen? I mean at least theirs looks good. I know, I’m being a snobby designer guy. Still it would have been nice to see something besides that ugly translucent plastic plate. And what were you thinking with the industrial design of the remote and base station? I mean seriously, even if the quality is rock solid, the design looks like cheap and rushed to market. If you are going to charge 600 dollars for a product, make it look good. Both Samsung and LG know how to do this. Take a lesson from them. INDIANAPOLIS, IN (January 5, 2010) – Klipsch, a leading global speaker manufacturer, is introducing what is possibly the most innovative design to hit the audio industry in recent years. Winner of a 2010 CES Innovations Award, the patented Klipsch® LightSpeaker® is the first product to combine efficient LED lighting and wireless ambient sound into a single unit that installs like a light bulb. The LightSpeaker, which comes complete with a dimmable LED bulb and full-range speaker, fits 5- and 6-inch recessed light fixtures with a standard Edison socket. Upcoming accessories will allow the LightSpeaker to accommodate hanging light fixtures as well as floor and table lamps. The speaker uses a 20 watt high-performance, low-distortion digital amplifier to deliver energy efficient sound. Furthermore, the LightSpeaker’s 2.5-inch wide dispersion driver uses digital signal processing to optimize high- and low-frequency output for a full spectrum of sound. 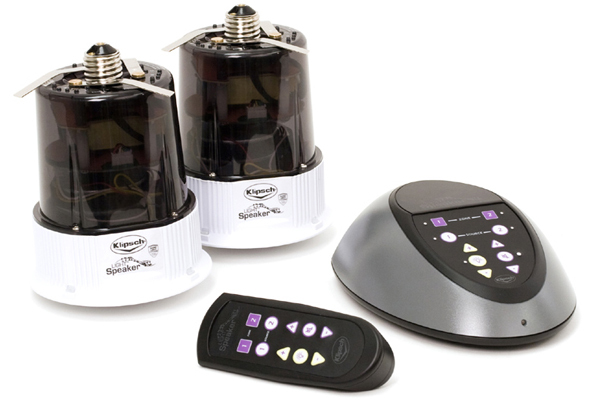 In order to deliver music wirelessly, the LightSpeaker relies on a standalone transmitter. A music source, such as a laptop, iPod or CD player, connects to the transmitter and it wirelessly sends the sound to the LightSpeaker. The transmitter’s 2.4GHz wireless technology accommodates up to eight LightSpeakers, equaling stereo sound in multiple rooms. You can connect two music sources to the transmitter, as well as establish two separate listening zones. The transmitter or remote will control the sources, zones, lighting levels and volume. The LED bulb is rated for 40,000 hours of use and can last over 15 years. It also reduces daily lighting expenses by 80 percent, using 10 watts to produce light that’s bright enough to replace up to a 65 watt bulb. Unlike incandescent bulbs, the LightSpeaker LED bulb contains no mercury or halogen gases and produces almost no heat. A bundled package, consisting of two LightSpeakers, a transmitter, radio frequency remote, mini jack to RCA plug cable, lenses and trim, retails for $599. Single LightSpeakers are also available for $249 each. Klipsch will begin selling the LightSpeaker on klipsch.com later this month, with broader distribution slated for March. LightSpeakers are for background music and not intended to replace home theater speakers. 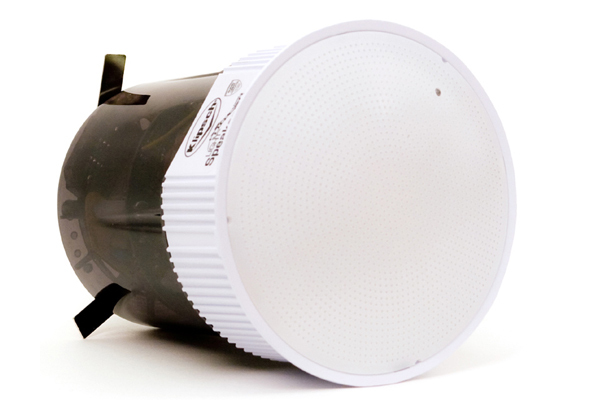 • 10W super bright LED provides a sharp crisp light that is easy on the eyes. • The E26 standard Edison Screw allows the unit to attach to any standard light fixture socket. • The high efficiency switch mode power supply delivers power to the LED and the digital amplifier without generating a lot of heat. • The on-board Digital Signal Processing delivers customized audio to each LightSpeaker® giving big speaker sound in a small speaker. • Integrated high frequency disperser. 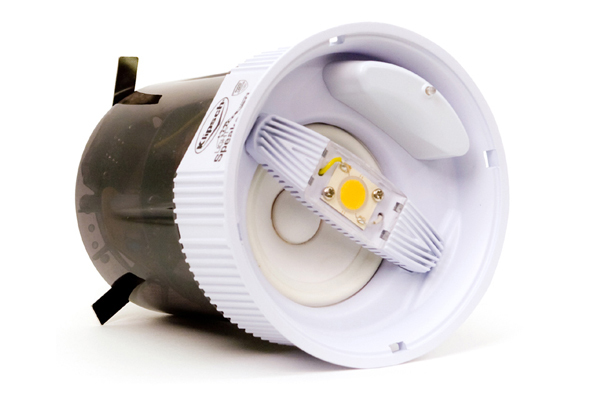 • Optional flange allows LightSpeaker® to fit into either 5″ (R30) or 6″ (R40) recessed lighting fixtures. • RF remote allows control of sound 50 to100 feet away from transmitter depending on the environment. Posted in Media and Mediums, Technology and tagged Air Port Express, Apple, Audio, Home Theater, Klipsch, Light Speaker, Soundbulb, Speakers, Streaming Audio, WiFi on January 5, 2010 by Author.